Happy Valentine's Day from Uber Entertainment. 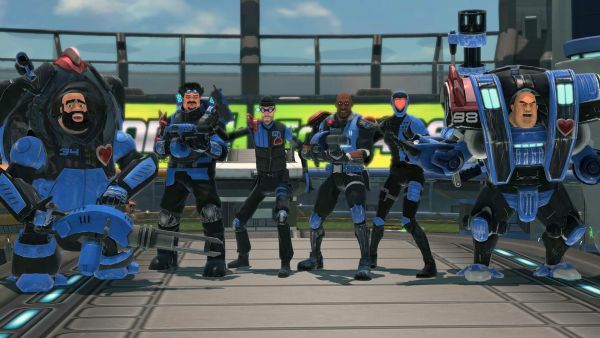 The developers of Monday Night Combat have a new update out for the Steam version of the title on PC. There are a number of features, adjustments, and fixes, which you can see below. New Crimson Gear is available for all the pros. It might sound tough, but it's really just Valentine's Day-themed armor. In honor of Valentine's Day, Uber also has a super-sensual music video, "You are My Pitgirl," which you can also see below. It's no "D! @% in a Box," but what is? If you have a special someone who has not yet played MNC, now is the chance for you to introduce them to the tower defense/class-based shooter. You can work it into your romantic evening with lines like, "Look, they're wearing hearts and stuff," or "There's a rose petal death effect, all for you baby," or even "My last girlfriend/boyfriend played video games with me. I guess she/he loved me more than you. Don't you want to express your love to me, digitally?" All these lines are guaranteed awesome. These updates are for the Steam version of the game. If you own the Xbox 360 version of MNC, you should know that Uber thinks you're a nice person, but likes you "only as of a friend." Bummer. MNC Crimson Gear. Pretty. They sell man-clothes where you picked that up? Graphics options have been moved out of HostileEngine. You will still have one more graphics reset with this patch, but all future updates should be reset-free. Uber is now shipping a list of banned players. The list has been compiled and vetted by the community and Uber. Individual server admins will now have to remove these player from their HostileAccess.ini file if they wish to allow cheaters on their servers. The default will be to globally ban known cheaters.